The Conference of Peripheral Maritime Regions’ (CPMR) Atlantic Arc Commission (AAC) has urged the European Commission to give its full attention to maritime investments aiming to increase growth and jobs in regions across the Atlantic sea basin. At a meeting today with Karmenu Vella, EU Commissioner for Maritime Affairs and Fisheries (DG MARE), a CPMR Atlantic Arc Commission delegation outlined the importance of the Atlantic Strategy, which is aimed at boosting investment in the maritime sector throughout the Atlantic region. 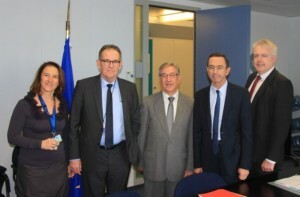 The delegation, which included Bruno Retailleau, President of the CPMR’s Atlantic Arc Commission and the Pays de la Loire region, Carwyn Jones, First Minister of Wales, Alain Cadec, President of the European Parliament’s Committee on Fisheries, and Eleni Marianou, CPMR Secretary General, suggested to Commissioner Vella that there should be improved funding incentives for major projects being developed in line with the strategy. Carwyn Jones, First Minister of Wales, added: “Supporting the development of ocean energy is one of our priorities as we want Wales, and its partners on the Atlantic coast, to become world leaders in this exciting sector. We look forward to working more closely with our partners to build markets and create a new industry in Europe”. The delegation also urged Commissioner Vella to give particular focus to the ministerial declaration on European Maritime policies, being developed by the upcoming Maltese Presidency of the European Union.